If you’ve used virtual reality, you’ve probably deampt up a million cool game ideas that the platform’s infinite possibilities could be used for. But did you dream up a rhythm game where you use dual lightsabers to slice blocks to the beat? Didn’t think so. Luckily, indie developer Hyperbolic Magnetism did, and they’ve got the talent to bring it to life. Update (2/7/18): After the Beat Saber teaser went viral last month, racking up several million views across various social media platforms, developer Hyperbolic Magnetism has released a full playthrough of the teased track. The playthrough not only gives us an opportunity the hear the entirety of the head-nodding track titled ‘$100 Bills’—composed for the game by musician Jaroslav Beck—but also offers a glimpse of further gameplay mechanics, including red zones which the player must dodge, and rhythm blocks which come at varying heights. Beck also published the standalone track on various music platforms for download or streaming. Original Article (1/19/18): As Rocket League (2015) has shown us, even crazy ideas can make for amazing games if executed well. Beat Saber, due out in Q1 from developer Hyperbolic Magnetism, looks to be on that track. The game offers up rhythm gameplay like DDR or Guitar Hero, but instead of dancing or playing instruments, you’re slicing blocks to the beat with a pair of lightsabers. A new teaser posted to Twitter by Beat Saber developer Jan “Split” Ilavsky‏ shows high speed gameplay with some thumping dubstep composed by musician Jaroslav Beck. From the teaser and the trailer we see some recognizable beat and direction patterns emerging, though I’m curious to know what other mechanics will be introduced—given the power of VR, I hope they’ll think outside the box and go far beyond the usual sustain mechanics… blocks flying at you from all sides could be very interesting, and how about using the lightsaber to reflect the occasional incoming laser fired by a flying drone? Of course there’s plenty of other solid rhythm games already available in VR. I’m partial to Audio Beats (2017), and Audioshield (2016) is also quite well liked. Granted, the use of lightsabers as the input ‘tool’ in Beat Saber could prove to make quite unique gameplay in a VR rhythm game thanks the player having extended reach, a feeling of destructive power, and the ability to attack notes from various directions instead of only relying on position and timing. Due for an initial release in Q1, we’ll have to wait and see if the gameplay feels as cool as it looks. There’s no word yet on which VR platforms the game is headed for, but we’d guess a Steam release supporting the Vive and Rift is likely. 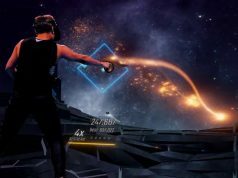 Update (2/7/18): An earlier version of this article stated that composer Jaroslav Beck was part of Hyperbolic Magnetism, the studio behind Beat Saber. However, Beck appears to be an independent composer who is contributing to the project. The videos seem to be “crazy difficult” and “what beginner looks like”. I’d happily play this somewhere in the middle…the first person video looks unpleasantly daunting. That looks really awesome. That’s how a VR rhythm game should be! Ha ha, I agree this looks both crazy difficult and immensely satisfying at the same time. This looks really polished, awesome work! We’ll also have guns as part of the progression: “Over time, we’ll add quite a few things like that, with different progression mechanics. In other words, some things, like different catcher mechanics (swords, guns ;-) ) will be available through grinding your way to a high accumulated score.”, see: https://steamcommunity.com/app/422860/discussions/0/142261027576169385/#c142261352645391570 … except we’ll use skill instead of accumulated “grinding score” to unlock those specific mechanics (skill tracking just landed in the game, it’s based on the difficulty of the maps). You can already unlock environments using your accumulated score (there’s also a cheat for journalists, so you don’t have to ;-) ). But we first need to finish work on procedural beatmap generation: It’s already in the game, marked as “Experimental”. Expect an official announcement about that this coming week. This one also had been on the list for way too long and I very much appreciate the player that said to me “lay everything down and add this right now” around Christmas. Usually, we don’t just immediately do exactly what players request: Sword based mechanics for Holodance were requested already in October 2015 by a Reddit user when I posted a video of one of the very early prototypes. Of course, ideas are a dime a dozen and it looks like Beat Saber is produced really really well, so kudos to the devs! 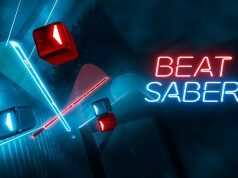 I’m looking forward to playing Beat Saber once it’s available. We just have a funny history with public perception: Holodance was shown to the public long before any word on Audioshield had been said (let alone images shown, let alone videos with actual gameplay being shown) – but still, even today, a *lot* of people still think it’s a kind of clone. Holy crap, this game looks amazing! The only problem I see is if it has a way to to input your own music. And if it does, there should be a way to create the obstacles, yourself, rather than relying on an automatic system.